Other than the main bridge crew of the Enterprise, nineteen other named members of Starfleet were seen and referred to in the 22 episodes of the Animated STAR TREK series. These Starfleet personnel from the animated series are listed below along with a small picture and a brief description. Those Starfleet members that were seen in the original series are indicated with an asterisk (*). Bell. (James Doohan). Starfleet officer aboard the U.S.S. Enterprise. Bell guarded the ship's dilithium vault with Lt. Gabler, when two Klingons were encountered in the restricted area. ("The Time Trap") Bell was only seen from behind. Wesley, Governor Robert*. (James Doohan). 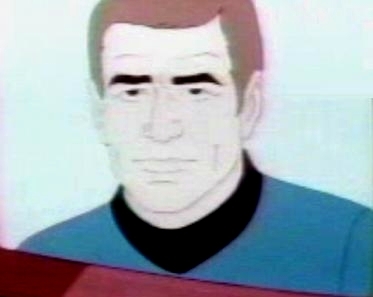 Former Starfleet commodore who became governor of the planet Mantilles in 2268. 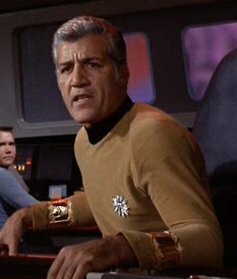 ("One Of Our Planets Is Missing") When he appeared in the original series, Commodore Wesley was portrayed by actor Barry Russo.